We don’t know about you but we love Easter! It’s such a lovely time of year where all the family gets together to have fun and spend some quality time together. Easter is also a crafty time of year with bonnets, baskets and cards to be made with the kids, along with organising the fun and exciting Easter egg hunt! We have some fantastic activity and gift ideas which we can’t wait to share with you all, you’ll love them and so will the rest of the family. Easter can be more fun when you have your little family traditions such as crafting with your little chicks. There are so many different activities for all ages to take part in there’s no chance they’ll be bored. Easter Baskets – the Easter Bunny and Easter eggs have become a bit of a hallmark for the Spring celebration and so the little ones are going to need something to carry all those goodies in. Now you could cheat and buy little wicker baskets or buckets to decorate yourself, however why not get the kids involved in making and decorating their own little baskets. 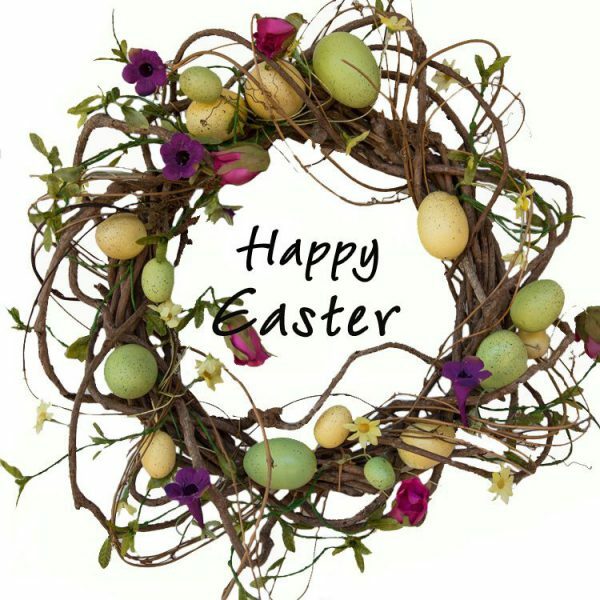 You can use brightly coloured paper or card woven together to form the basic basket shape and decorate with cut out eggs or glitter. Easter Bonnets – it wouldn’t be Easter without a bonnet, this tradition goes back many years. Why not get the kid’s to follow the old tradition by making their own. You could buy an old boater or straw hat and decorate with fluffy chicks, flowers and small eggs however it is just as easy to make you own out of sturdy card. You can make them as simple or over the top as you want. With many schools now hosting an Easter parade the bonnet is a must have, so go on, get creative! Bunny Ears – dressing up is all part of the Easter celebration, for the kids, make simple bunny ears out of cardboard or go for a full bunny mask- use pastel pinks, blues and greens for a fun Spring touch. If you’re feeling really creative, use old wire coat hangers to mould the shape of the bunny ears and paper mache over them, and then let the kids decorate. 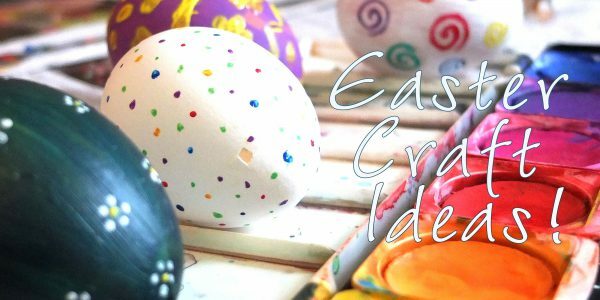 Decorative Eggs – girls and boys will love decorating their own Easter eggs; these can be used as decorations around the house or as part of the Easter egg hunt. Firstly wash the eggs gently in warm soapy water, use something sharp to piece a hole in both ends of the egg and scramble the contents inside, wipe away any of the raw egg and blow into one end until you are no longer seeing the liquid egg come out the other end, once this is done give the egg another rinse in water making sure the water rinses the insidetoo then leave to dry. Once this is done you are ready to get painting and decorating them. Paint them as chicks and rabbits for a cool table centre piece or by using water colour paints, sequins and glitter you can create some show stopping eggs that can be used in the big Easter egg hunt. For many children an Easter egg hunt is the most exciting part of the celebrations and its also fantastic fun for the grown-ups! Getting organised is the key to a successful hunt so make sure you buy all the essentials well in advance. Firstly decide if it is going to be an indoor or outdoor egg hunt, then decorate the area with pastel coloured balloons, bunny paw prints and garlands made up of bunnies and eggs to give it a fun Easter feel. 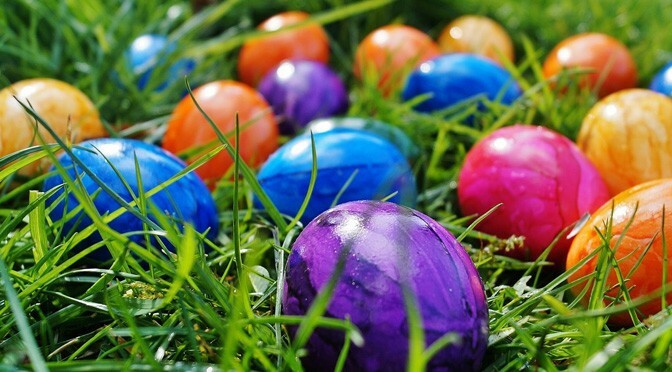 It obviously all depends on the weather but there is something quite special about an egg hunt in the garden, you can hide the goodies in flowerbeds, plant pots and flowers. 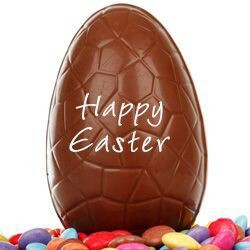 Secondly you are going to need lots of chocolate, choose small and large eggs to mix it up a bit, also choose some chocolate rabbits to hide. Another nice idea is to buy plastic eggs to fill with small goodies; these make a lovely surprise at the end of the hunt. Throwing in a few normal eggs is a good way of making sure the kids don’t eat too much chocolate. Why not turn the egg hunt into a bit of a treasure hunt, give them a map and clues to help them find the eggs or use the plastic eggs to hide those important clues. Don’t forget to buy a small prize for whoever collects the most eggs, this makes it fun and more of a game. Psst… nominate one of the adults to dress as the Easter bunny to help the children on their hunting mission; they too can join in wearing their bunny ears they made earlier. It is a bit of tradition in some households to give out small Easter gifts; it doesn’t always have to be chocolate though. 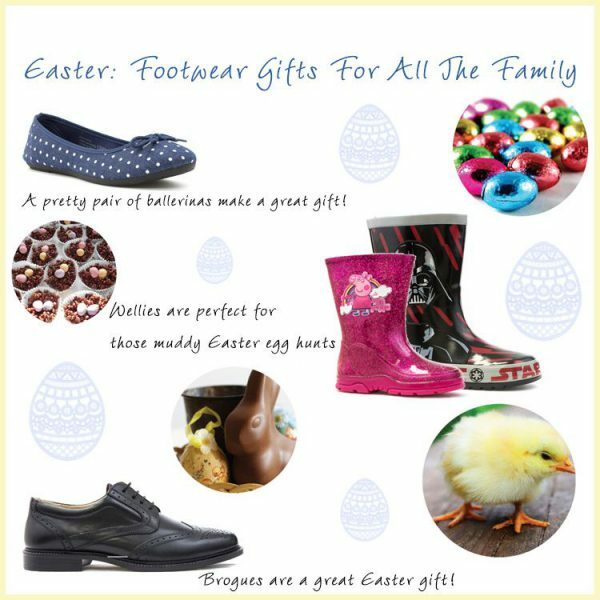 With Easter being all about a fresh start why not gift them some new shoes to take them into the new Spring season. Women – choose some pretty ballerina pumps that she can wear for both work and an evening out. With so many pretty designs to choose from for Spring go for light classic colours, pretty florals and sparkly diamantes. Pop a pair in an Easter basket along with her favourite chocolate and Easter eggs for a grown up gift she will love. Men – go for some stylish smart shoes that are perfect for the Easter celebrations. A pair of brown or tan lace up brogue shoes add an elegant touch to his jeans and chinos. Again add into a grown up Easter hamper along with chocolate eggs and his favourite tipple. Kids – for the little ones a pair of wellies are perfect for that Easter egg hunt in the garden, especially if the heavens open. Treat them to a new pair featuring all their favourite characters including Star Wars and Peppa Pig and don’t forget they can be re-used come the April showers. Snuggling up on the sofa to eat the rewards of the Easter egg hunt and watch a film with the family is the perfect way to round off the celebrations, do it in style and comfort by picking up slippers for all the family. With cosy mule slippers, warm bootie slippers and slippers featuring the kid’s favourites on there is so much choice to help keep all feet cosy. So remember to have fun this Easter. Get creative, eat chocolate and spend time with your loved ones. Set up the Easter egg hunt when the kids are in bed so they get a lovely surprise when they wake and be sure to get all the essentials well in advance. Plus don’t forget to keep an eye out for the all-important Easter bunny!